Cake Boss TV show on TLC season eight (Photo: TLC). Slip into your eating pants. The eighth season of the Cake Boss TV show premieres on TLC Tuesday, August 23, 2016 at 9:00pm ET/PT. Buddy Valastro and crew return with even more creative confections from Carlo’s Bakery in Hoboken, New Jersey. The Cake Boss TV series is produced by High Noon Entertainment and Valastro’s Cakehouse Media, for Discovery Networks International and TLC in the US. 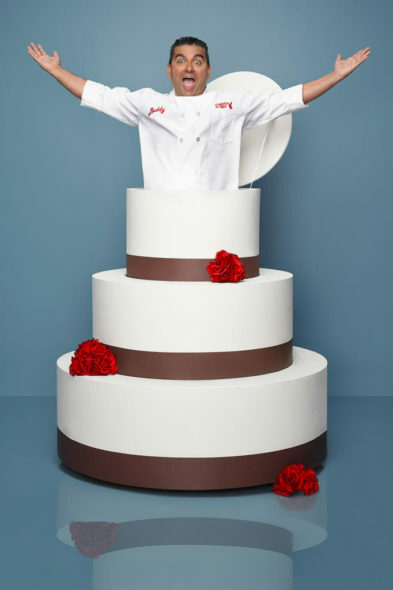 The Cake Boss cast also includes Mauro Castano, Danny Dragone, Joey Faugno, Anthony Bellifemine, Mary Sciarrone, and Ralph ‘Ralphie Boy’ Attanasia III. RELATED: Cake Boss TV show renewed for a ninth season on TLC. NEW YORK, NY – Buddy Valastro and the rest of the CAKE BOSS family return to TLC for an eighth season filled with new adventures and spectacular creations. On Tuesday, August 23rd at 9/8c, Buddy, his family and the loyal customers of Carlo’s Bakery in Hoboken will kick off the series with even more outrageous and delicious cakes. More than 50 years and thousands of customers later, Buddy and his team find a way to embrace every new challenge and create sweets that are larger than life. Buddy’s imagination works in over-drive this season as the exciting cake ideas from his consultations become a reality. In fact, his quest to achieve his late father’s dream of making Carlo’s Bakery a household name guarantees that viewers see Buddy in some of his most surprising situations yet. A legendary sand castle cake, a motorcycle jacket cake, a life-size grand piano cake and a one-of-a-kind Oktoberfest beer cake are just some of the wild creations to come out of CAKE BOSS this season. Some iconic clients also make an appearance, including the New York Botanical Gardens and the President of Germany. Along the way, surprise visits from old customers and milestones occurring within the Valastro family will make this season one of the most touching yet. Whatever the challenge may be, laughter and love are the main ingredients Buddy and his crew use to create these amazing sweets, but once again the Valastros prove that family truly is the sweetest thing! To celebrate the series return, fans are invited relive fun moments from past seasons on TLC.com, and for show updates, ‘like’ the Cake Boss page on Facebook. CAKE BOSS is produced by High Noon Entertainment and Valastro’s own Cakehouse Media for Discovery Networks International and TLC in the United States. Cake Boss TV show on TLC, season eight (TLC). What do you think? Are you a fan of the Cake Boss TV show? Do you plan to watch the show’s eighth and ninth seasons on TLC? How long do you think the series will run? More about: Cake Boss, Cake Boss: canceled or renewed?, TLC TV shows: canceled or renewed? I hope Buddy & his family continue filming . I can’t imagine them not being on the air! America not only need this show but we need more wholesome, family oriented, good hearted humans like Buddy & his family. He never gets to big to be a humble giving person, and that is a rare thing. My grandkids watch with me and learn as Buddy leads.